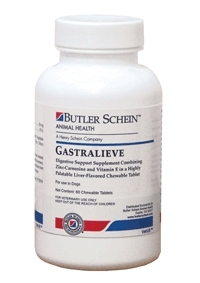 Gastralieve is used as a digestive aid in replacement therapy for dogs and cats where digestion of protein, carbohydrate and fat is inadequate due to exocrine pancreatic insufficiency. It is fortified with soluble vitamins A, D, and E, which are fat soluble. Protects gastric mucosal cells from damage due to bacterial toxins, dietary indiscretions and NSAID pain medications use.